Born in Japan, Yasutaro Yamaga came to British Columbia in 1908. After working as a labourer, he purchased ten acres of land near Haney, B.C. Yamaga led the Japanese Farmer's Union in the Fraser Valley. After World War II, he moved to Ontario, where at Beamsville he established the first home for Japanese Canadian senior citizens (Nipponia Home) in Canada. 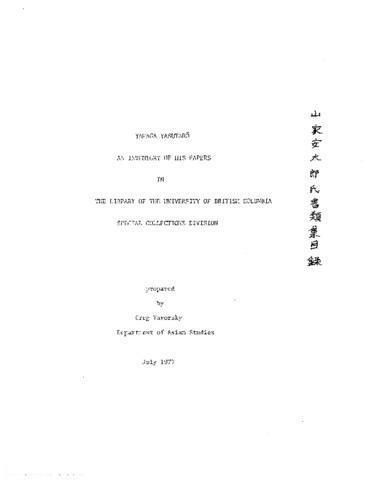 The fonds consists of biographical information, diaries (1962-1966), manuscripts, correspondence and collected historical material pertaining to the Haney Agricultural Association (1906-1962), Fraser Valley Japanese Language School (1920-1953), Nipponia Home (1941-1969) and the Japanese Canadian United Church (1919-1966).